Figure 1. (Top) Structure of M4O4 cubane-like complexes. (Bottom) Experimental induced spin density in the S = 2 ground state at T = 2 K, H = 7 T, in Cu4O4 projected onto Cu2O2 planes with different bridging geometries. Molecular magnetism is a relatively new field of research, which has attracted growing interest among physicists since the discovery, fifteen years ago, of the first “single molecule magnet” (SMM), Mn12-acetate, which behaves as a magnet at the molecular scale below a blocking temperature of 3 K. The present challenges in this field consist in understanding how to control magnetic anisotropy in order to obtain SMM behavior at higher temperatures, and in designing new multifunctional materials possessing other functional properties in addition to magnetism, e.g. magnetic photoswitchable compounds. Optical magnetic switching in the solid state raises questions of fundamental interest as to the mechanisms governing phase separation into magnetic domains or continuous structural changes during photoexcitation. The goal of the CEDA project, supported by the ANR (2008-2010), on the Convergence of Electron spin, charge and momentum Densities Analysis, is to combine data obtained by different techniques on the electron density in order to refine a unique model, thereby allowing the electronic structure of magnetic molecular compounds to be more accurately described. This work involves theoreticians (SPMS, ECP), x-ray (CRM2, Nancy) and neutron (LLB) diffraction specialists, and chemists (LMI, Lyon). The first step devoted to the joint refinement of charge and spin densities from x-ray and polarized neutron diffraction data sets has been completed. In this approach, the multipole mode l is used to describe the densities of spin up and spin down electrons, the sum (or difference) of which is the charge (spin) density. The software called Mollynx was developed by splitting the electron density model into two spin components. Experimental data were collected by x‑ray diffraction at CRM2, and polarized neutron diffraction on 5C1 at LLB on two cubane-like [M4O4] complexes (M = CuII, NiII), synthesized in Lyon (LMI) (Figure 1, top). 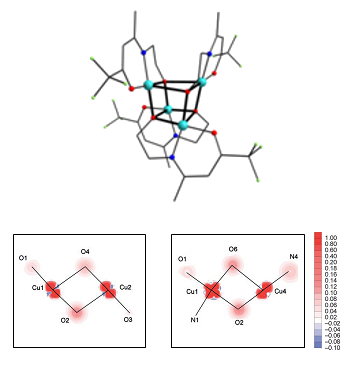 The joint refinement of these data is expected to ensure a better characterization of the metal-ligand bonds and a more complete understanding of their role in the intramolecular magnetic interactions and the magnetic anisotropy. The first analysis of the PND data alone  shows that the experimental spin distribution in the Cu4 complex is mainly located in the basal planes of the CuII ions and visualizes the magnetic interaction pathways via the bridging oxygen atoms (Figure 1, bottom). N.K. Hansen and P. Coppens Acta. Cryst.A34, 909 (1978) . C. Aronica, Y. Chumakov, E. Jeanneau, D. Luneau, P. Neugebauer, A.-L. Barra, B. Gillon, A. Goujon, A. Cousson, J. Tercero, E. Ruiz, Chem. Eur. J. 14, 9540 (2008). Figure 2. Light induced phase separation (LIPS) in the molecular complex [FeII(ptz)6](BF4)2. Top: protocol for the LIPS investigation in the LITH loop (in red), nHS is the fraction of photoinduced HS state : irradiation by light at 470 nm (10mW) at 10 K, then heating up to 53.5 K with light switched off and again light irradiation at 53.5 K. Bottom : (2, 2, 4) Bragg reflection on the neutron Laue diffraction diagram (a) after partial photoexcitation at 10 K, light off: (HS, LS) random state ; (b) at 53.1 K, light on: evolution of the splitting, as a function of the light irradiation time, towards the LS and HS structural positions. Progress has been achieved in the investigation of the photoexcitation mechanism in the spin-crossover complex [FeII(ptz)6](BF4)2 in collaboration with the GEMaC (Versailles). The photoinduced structural transformation between the low spin (LS) ground state (S = 0) and the high spin (HS) excited state (S = 2) was studied on the neutron Laue diffractometer Vivaldi at ILL, equipped by the in-situ photoexcitation setup developed at LLB . 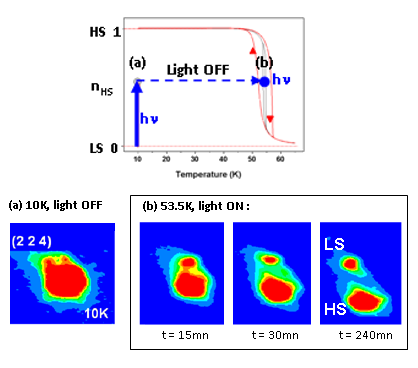 In a previous work , we observed a continuous transformation corresponding to randomly distributed LS and HS molecules during the irradiation of a single crystal by a laser beam (470 nm) at T = 2 K. According to a theoretical model based on the competition between photoexcitation (LS → HS) and relaxation (HS → LS), a light-induced phase separation (LIPS) between HS domains and LS domains was expected in an instability region inside the LITH (light induced thermal hysteresis) loop (Figure 2, top). We have provided evidence for this process, as illustrated by the evolution of the photoinduced splitting of one reflection as a function of the irradiation time at 53.5 K (Figure 2, bottom) . A. Goujon, B. Gillon, A. Gukasov, J. Jeftic, Q. Nau, E. Codjovi, F. Varret, Phys. Rev. B, Rapid Commun. 67, 220401(R) (2003). A. Goujon, B. Gillon, A. Cousson, A. Gukasov, A. Debède, J. Jeftic, G. J. Mc Intyre, F. Varret, Phys. Rev. B 73, 104413 (2006). F. Varret, K. Boukheddaden, A. Goujon, B. Gillon and G.J McIntyre, Z. Kristallogr. 223, 250 (2008).